Ted Hughes has been named the new KZN Breeders Club Chairman after yesterday’s AGM held at the Nottingham Road Hotel. Ted takes over the reins from Bruce Le Roux (Spring Valley Stud), who has stepped down to position of Vice-Chairman. Director Warwick Render thanked Bruce Le Roux for his tremendous work, effort and ideas over his two year tenure as Chairman, as well as the work put in by Anton Procter who stepped down as a Director of the KZN Breeders Club. 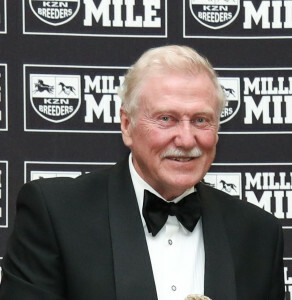 Ted Hughes is passionate about the Thoroughbred breed in both racing and breeding, and can usually be seen at each KZN race meeting with his wife Ruth – each racing horses in their own colours. Ted owns stallion Golden Sword who stands at Yellow Star Stud, a full brother to Gr1 Melbourne Cup winner Rekindling and to Gr1 2nd French placed Sydney Opera House. Ted has a close association with the family that bred Golden Sword and he didn’t hesitate when the opportunity came up to buy the son of High Chapparal, who was standing at Summerhill. Ted paid a visit in 2018 to visit the birth place of Golden Sword and see his dam Sitara, by Salse. Ted has his own extensive experience in training racehorses as well as previously race riding in England. Congratulations to Ted Hughes and we look forward to a successful future at the KZN Breeders Club. The KZN Breeders Club Board consists of Lee Scribante, Mick Goss, Cathy Martin, Bruce Le Roux (Vice Chairman), Warwick Render, Koos De Klerk and Ted Hughes (Chairman).